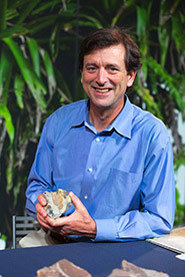 An interview with Scott Wing, Curator of Fossils at the Smithsonian Institute’s National Museum of Natural History and a Yale educated expert in what happened when earth had its last period of global warming. We’ll talk about what he learned that could help us understand and avoid repeating that turbulent time. Scott is a great storyteller and passionate advocate for the environment.His work was featured in this article in National Geographic. If you like this show, you’ll also be interested in programs #0059 and #0060 about ancient earth and what it can tell us about the future.